SP's East Portland "Produce Row"
After reading a number of other fine ongoing construction efforts on this forum, I've decided to put mine out there. At least it will help me to keep interest up and spur me along. 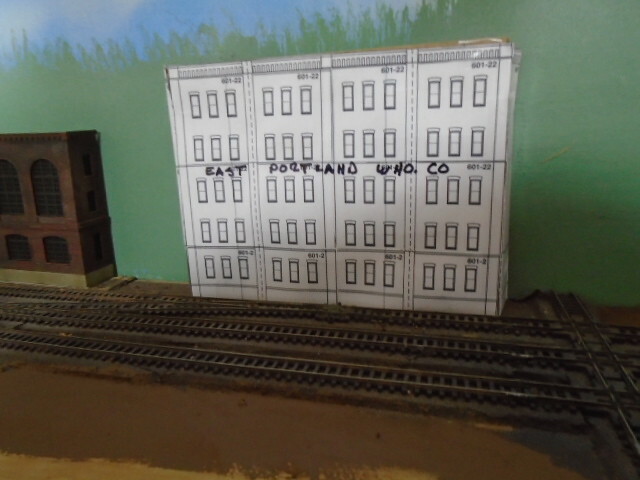 My N-scale layout depicts East Portland (OR) along the SP, UP, and SP&S in 1955. This area is also referred to as "Produce Row" due to the many produce warehouses. Reefer movements will be heavily featured. The area has been heavily changed since I-5 was built through it starting in 1958. Progress has been relatively slow over the past 15 yrs or so as mainly I have done a lot of research (research libraries, historic photo archives, field trips, etc) but has moved along as I am now starting to tackle the basic scenery and figuring out how to construct/represent the featured buildings and bridges. Track is Peco Code 55 with Electrofrog switches except for a number of short-radius Set-track switches used for industrial spurs. Control is by Digitrax DCC broken into three power districts to cut down on the diagnosis time of any electrical gremlins. This is a point-to-point operational scheme that will be using the "Car Order" card system (featured in the NMRA Bulletin a while back) so I can focus on the movements rather than the individual car numbers. 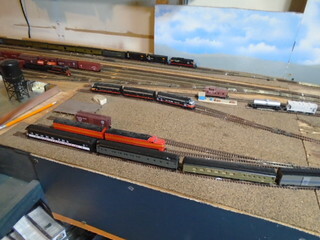 The layout focuses on the car movement via transfer runs between SP's Brooklyn Yard, UP's Albina Yard, and the Northern Pacific Terminal Yard (SP, UP, SP&S). I estimate between the arrival of incoming staged freights, yard classification, switch jobs and transfer runs, a car may be in 6-7 different train movements before it "leaves" the physical layout.The whole layout is within yard limits so speeds are slow and slower (6-20 mph). There is also a lot of switching of industries plus some passenger movements on the SP (mostly the head-end heavy Klamath, the mixed Rogue River, and the Shasta Daylight). Occasionally the Portland-Seattle NP "pool train" #408 may appear at the station for contrast. The only track plan I have is heavily out-of-date since I've done many many modifications over the years to improve the trackage configurations so I'll show it in pictures instead. This is the furthest "east" portion representing the outer Union Station platform tracks and the NPT yard on the west side of the Willamette River. Along the backdrop will eventually be the flats for the Post Office, REA, and the ex-UP freight house (now Acme Fast Freight). The track will disappear under the representation of the west end of the Steel Bridge (the real tracks cross the river on this unique double-deck lift bridge where the RR deck can telescope into the roadway deck). On the east side of river (the far left were the tower is will be the east approach viaduct of the Steel Bridge). The SP tracks are in the foreground and UP tracks are in the rear. The track that disappears off the edge is the UP track that goes east up Sullivan's Gulch (now where I-84 runs). 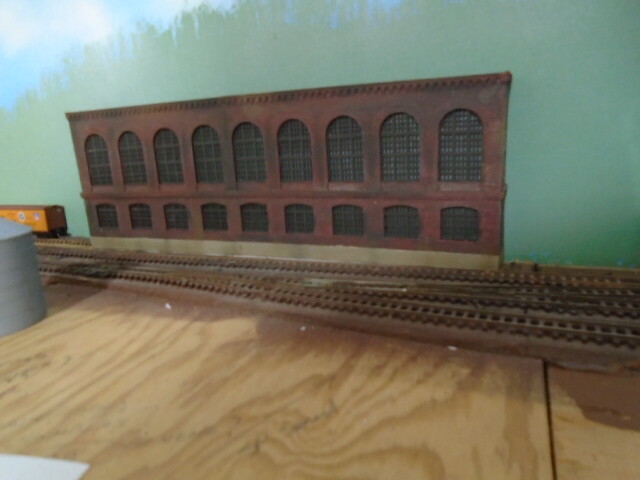 Warehouses will be between the SP_UP tracks as well as in the back. The pile of sticks in the river are for a lumber wharf that SP used to transport rough-cut lumber. This will be built mostly piece by piece. 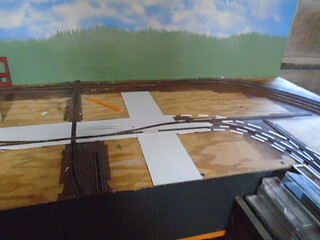 This scene will feature the SP's East Portland freight house for LCL (back) and the produce team tracks (front). 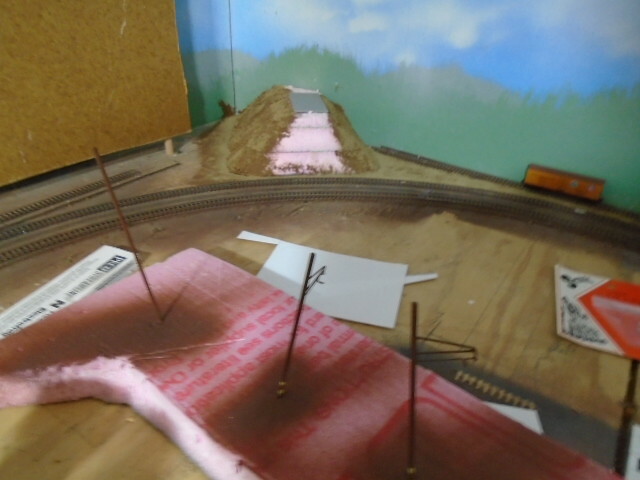 The UP tracks are mostly in the street, so I am constructing styrene streets that are slightly below the railhead so I can clean the tracks without scratching the roadway. The far right side of the picture is where the east approach of the 6-lane Burnside St bridge will be. This the core of the East Portland district with the SP running up 1st St, and UP up 2nd St . I've gotten a bit further with the streets in this area. The backdrop represents the Portland West Hills across the river. The SP&S runs up 3rd St (Aisle) and then crosses the UP and SP at grade (Aka SP&S Crossing). There will be full 3D buildings on both sides of 2nd St and flats along the backdrop. This area shows the eventual route of the Grand Ave viaduct that will cut diagonally across the layout. The left side shows the spurs for the Consolidated Daily Co-op elevator (right) and the Darigold dairy/powdered milk plant (left) . 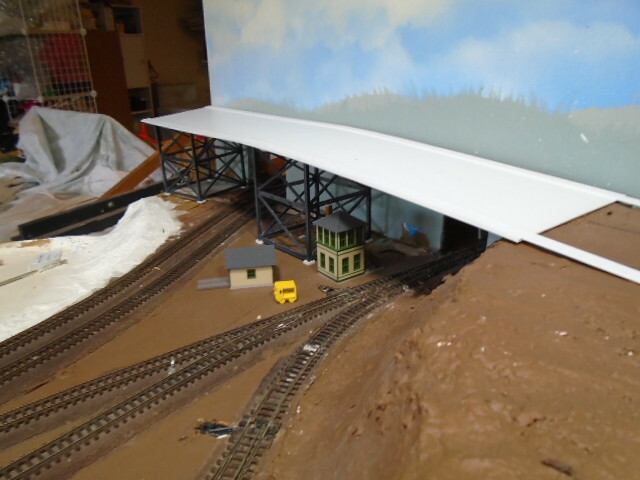 The leaning backdrop section will eventually be hiding staging on the other end of the layout. A large Oregon Liquor Control Commission warehouse and a couple gas holders (landmarks on this side of the river) will be along the backdrop here. 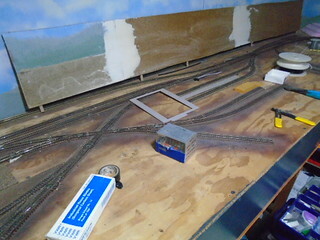 This represents the north edge of the Brooklyn yard area with the tracks for the icing dock (in reality these were located on the other end of the yard but I didn't have room there), team track (next to the undecorated dock), and stock pen, and retail firewood/coal yard. 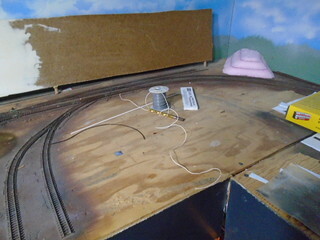 The mainline curves toward the backdrop to go into staging for passenger trains while the yard lead and arrival/departure tracks are in the middle. This is half of the Brooklyn engine terminal . The ABA set of F's is sitting on the turntable lead track. The open area will be for shop storage and storage tracks (MOW, specials, etc) . 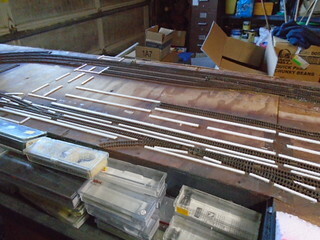 In the middle are the caboose track and engine terminal fuel/sand supply track. The rear shows the yard ladder and passenger staging with the Rogue River ready to come "on-layout." Another view of the yard tracks. The open area is where the turntable will go (100' from Diamond Scale) - you can just see the pencil planning outlines. The tools on the right are sitting on the location of the 4-stall "Big-house" (was for GS-4's , MT's etc) while the soldering iron is sitting on the garden track locations. Last view is the "Points South" freight staging/fiddle yard that represents other Oregon SP destinations. There will be the Holgate Ave overpass and another short section of backdrop to go here to mark the transition to the staging yard. Re: SP's East Portland "Produce Row"
Looks like a neat concept, I will follow with interest. What's the overall size of the layout space? It just clicked in my old mind tonight that the initials of this site (TRW) meant something completely in the 1960's ... then it meant aerospace! The overall size is 9 x 14 allowing for a 2' walkway at the front. This takes up about half of the garage. The clouds are from a set of paper templates I picked up at the 2004 NMRA convention in Seattle plus white spray paint. Depending on how long you spray you can make wispy clouds to thicker ones. I like how it looks like I've added gray shadows in places but its all just one color. Very cool! I guess this is portland before skinny jeans and ironic facial hair, right? Yep! Portland of the 1950's wasn't that much different from the 1920's. The current skyline and other major developments didn't occur until the 1960's . In the case of the layout, most everything from 1st St to the river got razed and the effect of the freeways put a damper on the older developments combined with other changes (moving away from multistory warehouses to one-story large area bldgs). Only now the eastside area is undergoing a revival with smaller businesses (the tracks down 3rd and 2nd are mostly paved over). Holiday preps always seem to get in the way of progress, but in the meantime I've been buying more bridge parts and even managed to find a Walther's Sunrise Feed Mill kit that I will use for kitbash fodder on a combo feed mill/burlap bag factory. I also found use for a old Bachmann Bakery (the old Heljan re-purposed enginehouse kit) that I received as a gift many moons ago. One of the structures that I am needing was a warehouse for granite products and I actually found a picture on a set of old aerials I had found in my latest internet searches (more and more old historical pictures are being put up and digitized so it pays to do periodic searches) .And there it was, a brick, single story, paired-window, peak-roofed with skylights structure that took most of the lot. Just need to add a new loading door and and a dock plus a few other details and this will fit right in. I'll get a pic once I'm a bit further along. 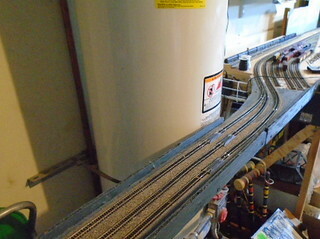 Just received my Tam Valley Hex Frog Juicers so I can complete the track wiring for the Brooklyn yard and terminal area. I had planned on using micro-switches instead but my trials never seemed to work right (couldn't get the stiff music wire to reliably actuate the switches). From that I moved to cut down dpdt slide switches but the few I'd done were such pains to do, it actually stalled much progress on the Brooklyn side of the layout. I decided to bite the bullet and order the juicers instead for the remaining ones. I also ordered some more wire, LED's and terminal strips that will support this task and future detection, signaling, and bldg lighting which should be here tomorrow. With this I'll be able to have steady progress in the next week while I'm on vacation. 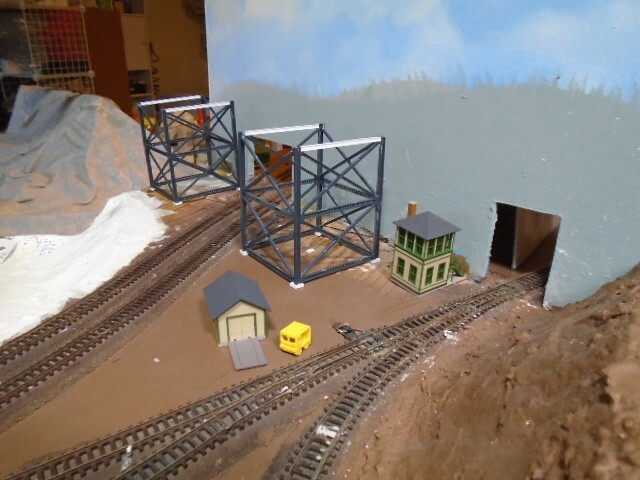 Finished building the east approach towers and the and west approach tower and piers for the Steel Bridge. Here they are in a test fitting in their approximate places. I will still need to level them out and paint but won't do that until the deck substructure is substantially done. Neat. I see a kink in the track in your bottom photo though. It's right after the switch's straight leg on the near track. I see that too...hmm...I'll add it to the track gang's fix list. It's always interesting to see what the camera lens sees vs your own eyeballs! As I work on specific areas, I get to thinking about what is needed for them down the road. One of these, is the road crossing in my last photo above (flanked by the concrete piers). On the prototype, there are just a set of crossing flashers here at this time. I was originally thinking of using an Azatrak crossing module with between-the rails infra-red detection. The big issue here is the penetration through the backdrop really represents about 1000' of 6 mph track over the river. Any switching on the other side of the backdrop should never pass the vertical plane of the backdrop, so having detectors out on that side is really too far away. On this side, because of how close the platforms and yard track switches are to the road and the backdrop, switching movements will likely pass the backdrop a bit (the operator will just have to ignore that what that represents). The presence of the switches here either would mean that the IR LEDs are in the switches or I need one in each of the four approach tracks making the detection somewhat complex as it may require additional detection boards. 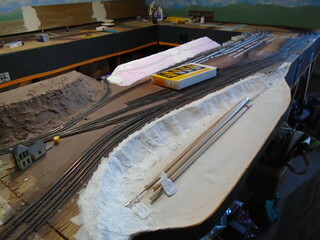 Because of the point-to-point design of the layout there is no sitting back and watching things happen as there would be someone intently working the area. I'm kinda stuck on what do here...I could simplify this with a pair of IR detectors in "across-the-track" mode for both tracks , so that any beam broken would keep the signals on and that once activated and any second train that happens to come along in the same direction while the first is passing would just end up extending the activation. Opposite movements might just confuse the circuitry though in this simplified arrangement, so I'm not sure that this would work well enough. While I could hide one set of LEDs at the backdrop under the bridge, the second set would need to be disguised in a maintenance/equipment shed or parked vehicle. The second idea, would be to forgo the Azatrak and just use an Ngineering alternating flasher module connected with a toggle switch. The operator of any movement that could go across the switches in any direction would need to manually turn the circuit on , then turn it off when it cleared. 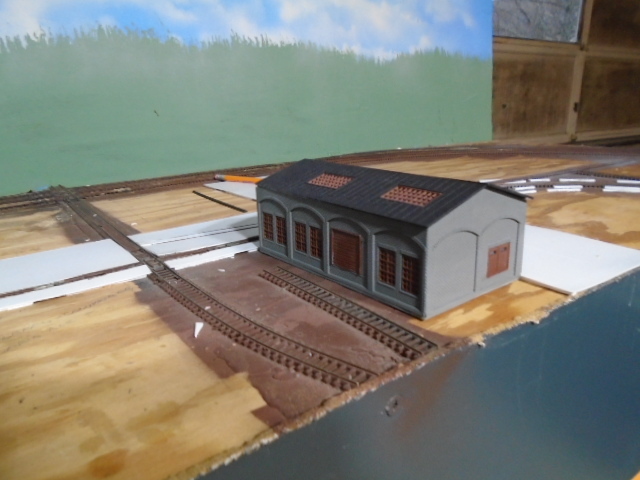 Here is a new milestone...the first actual building on the layout! As I explained in an earlier post, while this is a common model structure, it actually fits as a compressed version of the actual one. 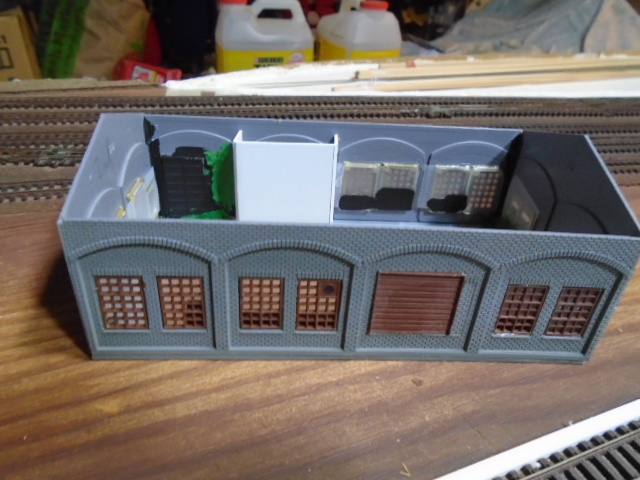 I modified it with a roll-up door for the street access and one for a trackside loading dock, I still have a bit to go on it with external details such as steps, loading dock, exterior lighting, gutters/downspouts, electrical service boxes, etc. I won't affix the roof permanently until I get the lighting done and add a bathroom vent and a furnace stack. I'll do some weathering and figure out a name for it ...The Sanborne maps just had "granite warehouse" so I didn't get lucky with a company name as most often is the case. Once the work is complete it will be settled in and the "grounds" completed so the landscaped areas will spread from this point (and others). Here's what I do for the interior of buildings. 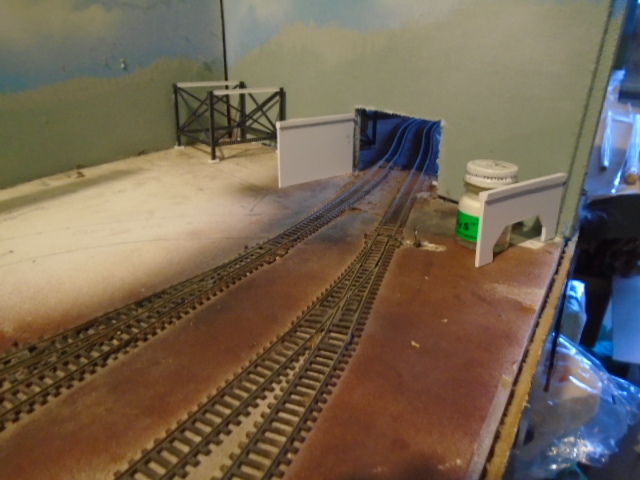 A lot of the post-construction work is to eliminate any light leaks so i will paint any translucent areas or parts black such as the Tichy loading dock doors and in the corners. Any gaps get puttied and I add Scotch magic tape to the back of the glazing to make the windows translucent for areas that won't have any interior details. Warehouses like these frequently have product stacked higher than the windows so I painted geometric black areas on the tape to represent the light being blocked so i looks like something is in there. I also added a light block for the office area as there would be some sort of office/bathroom. I haven't decided to add a light just in this area, but it will look different from the outside regardless. Finished the next building ...this is the Portland General Electric's, "Substation L" main building built by unfolding a Walther's powerhouse kit. The substation yard will be across the tracks in a future project. I've decided to work along the backdrop for now and work forward into the scene. I did a quick mock-up for the next structure, the "East Portland Warehouse Co." since I figured it would be a while until I settled on what to do here. even though I used DPM templates, I knew I did not want to use DPM modulars here since the building directly in front of this one will be using them. This month's "No New Modeling " Challenge inspired me to dig thru my box o'junk and I found enough old parts to build the warehouse in approximately the same footprint as the mockup. I love it, the solution was there all the time . I also started playing in the dirt, by putting down some basic brown paint and a single layer of Scenic Express dirt just to start getting away from the plywood look. I also cut out a styrene concrete retaining wall to go against the stub track as it curves into the backdrop and the lower part of the future highway bridge abutment (they are elsewhere being painted). 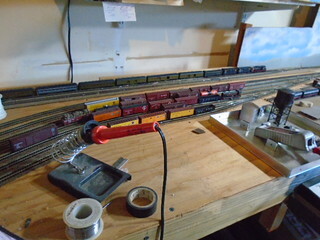 In the foreground are the painting-in-progress on the interurban line poles to go on the backdrop track (where the reefer is). Also made some progress on the Steel bridge approaches with starting on the decks. The east side (four lanes) is really floppy as the sidewalks are the really the only thing holding it together. I was waiting on the bridge beams and railings to show up and since the last of them showed up late last week I can start work on the substructure. The west side is a lot more rigid as I added the railing base, sidewalks, and part of the pavement. 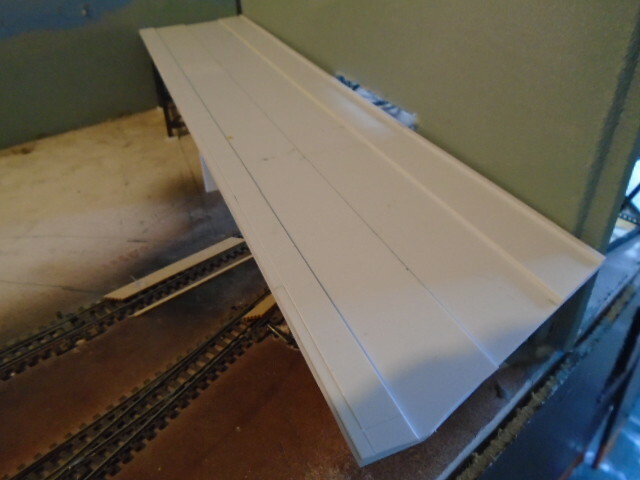 This side will have a pair of narrow-gauge out-of-service trolley tracks on them and I was waiting on the Code 40 rail to show up so I built as much as I could. Now that the rail has shown up, all I can say wow that stuff is small! With the weathered pieces that I got, I had a hard time seeing which end was up (I hope I put them in correctly..lol). 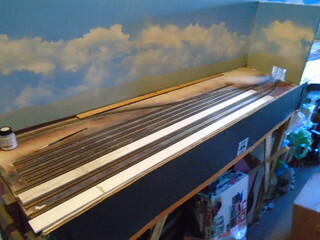 Also took out "Ed's kink" on the passenger platform track (see above posts) by doing a small realignment. 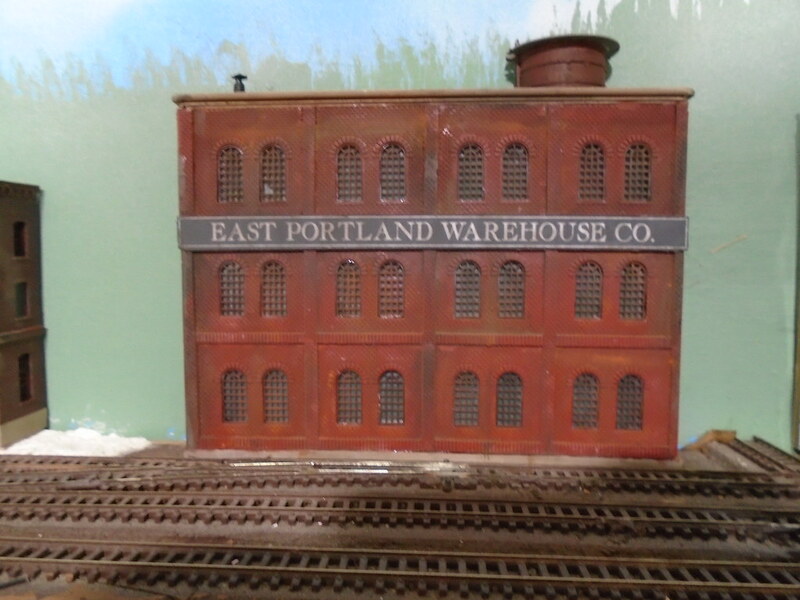 Thanks to the "No New Modeling Challenge", I finished the next building " East Portland Warehouse Co." along the backdrop and placed it in its location. I was kinda at a loss of what to do here but I like what I came up with out of scrap leftovers and old kit parts that date back from when I started with N.